Our Barbour Westmorland wax gilet is made using Barbour's classic 6oz Sylkoil 100% waxed cotton. This is one of, if not the most popular Barbour wax gilet out there. As a result of using their Sylkoil wax, this Barbour Gilet offers great all round protection as well as giving a flexible feel and is drier to handle then the previous Thornproof finish. All this combined makes this wax gilet a very popular piece of outdoor clothing. Customers will find that their Westmorland gilet is very styled while still in a relaxed fit. Enabling free movement when out and about, out shooting or working outside. Featuring a 100% lightly wadded cotton Barbour tartan lining, which will certainly provide extra warmth to this wax gilet. Your Barbour gilet is fastened using the two way front zip and also features a branded with Barbour studded storm fly to keep out the wind and rain. There are many features on the Westmorland wax waistcoat, which include moleskin lined handwarmer pockets, two generous bellows pockets, and most noteworthy a corduroy lined collar dressed in Barbour's iconic tartan. 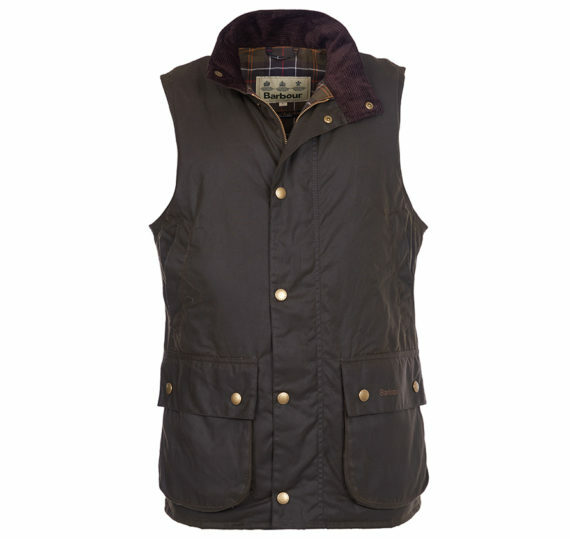 Furthermore, a Barbour Westmorland gilet is popular to wear all year round and is great for outdoor use. Overall this is a perfect addition to any country wear clothing wardrobe. Back Length: 72.5-82.5cms | 28.5-32.5"
If you are still not sure what size wax gilet you require, please feel free to get in touch with us. Finally, Customers can view more of our Barbour wax clothing in our Barbour clothing category.